I wanted to let you know about a new book that I think you’ll like…. Because I LOVE it. 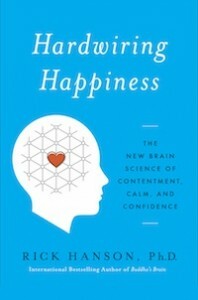 It’s called Hardwiring Happiness: The New Brain Science of Contentment, Calm, and Confidence. It’s written by my colleague — neuropsychologist and bestselling author Rick Hanson, Ph.D. — and it lays out a simple method that uses the hidden power of everyday experiences to build new brain wiring full of happiness, love, confidence, and peace. Recent scientific breakthroughs have revealed that what we think and feel actually changes the brain. Can I get a shout-out for science? Dr. Hanson’s Hardwiring Happiness is the first book to show how to transform the simple positive experiences of daily life into neural structures that promote lasting health, feeling cared about, and effectiveness. To keep our ancestors alive, the brain evolved a “negativity bias” that makes it like Velcro for negative experiences but Teflon for positive ones. This might have been good for survival, but today this bias makes us needlessly stressed, worried, irritated, and blue. Even worse, the inner strengths – like self-worth or positive emotions – we need for the long road of life are mainly built from positive experiences. But these usually flow through the brain like water through a sieve, with no lasting value. Drawing on neuroscience, evolutionary psychology, and wisdom from the contemplative traditions, Hardwiring Happiness shows you how to overcome the negativity bias and get good experiences into the brain where it can use them. By taking just a few extra seconds to stay with an everyday positive experience – the deliciousness of a cookie, the calming in a single breath, the warmth of a friend – you turn good moments into a great brain that gives you a durable resilience and well-being. If you would like to pre-order a copy now before the book comes out on October 8th, and receive the free bonus of Dr. Hanson’s “Your Best Brain” multimedia presentation, visit www.rickhanson.net/hardwiringhappiness. Join Dr. Sara’s Book Club!